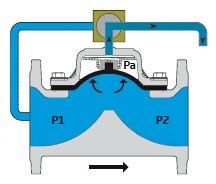 such as stem, bearing and seat exist in main valve body. The valve position will be controlled by a hand operated selector valve. Valve size same as main line or one size smaller. Maximum flow speed for continuous operation 5.5 m/sec (18 ft/sec). 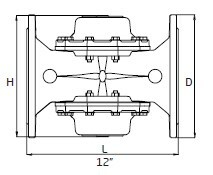 3-way pilots are recommended to use at the application which has very close values between upstream and set pressure because of 3-way pilots provide less head loss. 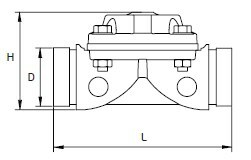 Armas Pressure Reducing Control Valve is the hydraulic control valve which reduces high upstream pressure value into desired lower pressure value by means of built-in pressure reducing pilot valves. 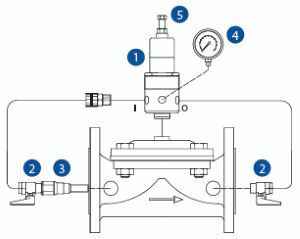 Pressure reducer control valve controls downstream pressure value continuously and maintains it constant without being affected from flow rate and upstream pressure values. When no flow exists in the system, it is closer by itself automatically. 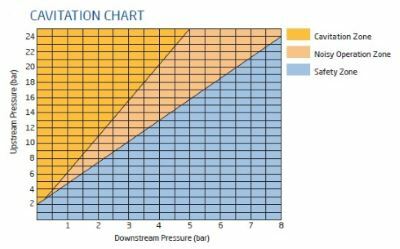 When valve upstream pressure value decreases below adjusted downstream pressure value, it is opened fully by itself. 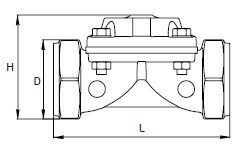 Armas 600 series valves are the direct diaphragm closing automatic hydraulic control valves which work with line pressure. 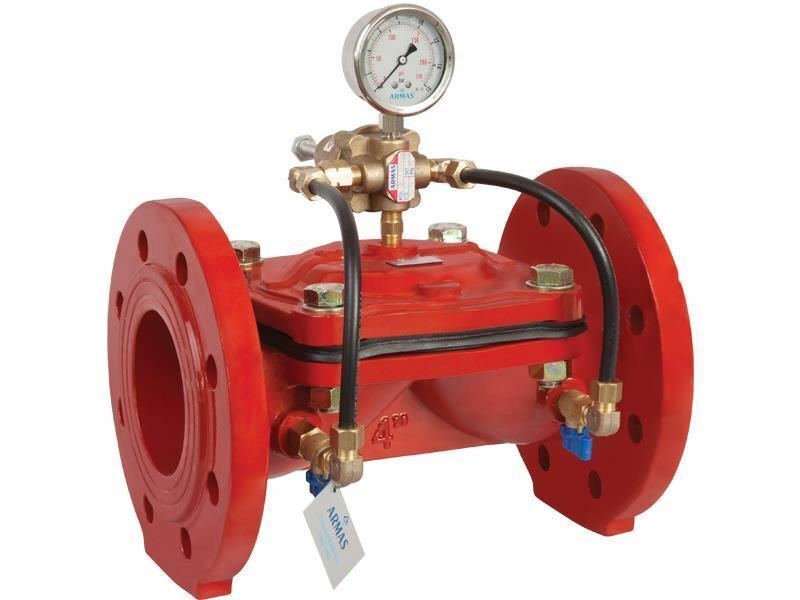 It ensures easy and smooth flow with minimum pressure losses thanks to excellent design of valve body and diaphragm. 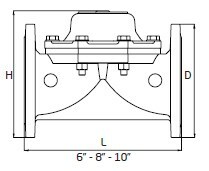 No wearable parts such as stem, bearing and seat exist in main valve body, valve life is much longer than other competitor valves. Only movable part of valve is diaphragm. 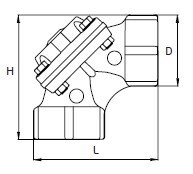 Armas 600 serial hydraulic control valves are designed so that it can be used in potable water force network, agricultural irrigation, fire fighting, filtration, industrial applications by even an unskilled personal. It is automatic hydraulic control valve designed for make desired modulation processes in main valve network line as full hydraulically by means of line pressure without requiring different energy sources such as electric, pneumatic on mechanic energy. 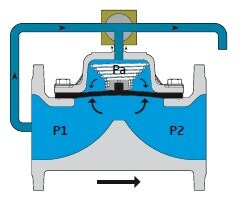 When pilot valves connected on main valve transport water pressure in valve upstream to valve actuator (control chamber), water creates a hydraulic power on valve diaphragm. This power formed, by combining with extra power applied by inner spring, ensures that valve will be closed as full tightness. 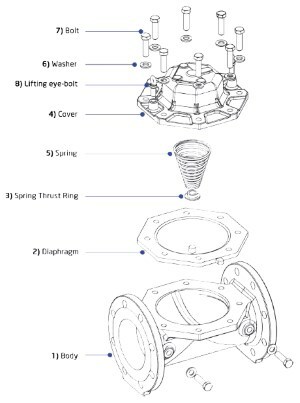 When way of pilot valve located on main valve being in closed position is brought into relief position, pressurized water within control chamber on main valve diaphragm is released. 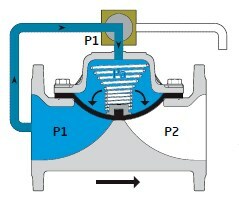 When line pressure (P1) reaches to the value which will overcome spring power, water carries valve to fully open position by applying a hydraulic power to valve diaphragm from bottom. Pilot valves which are connected to main valve actuator ensure that main valve works in modulated mode. 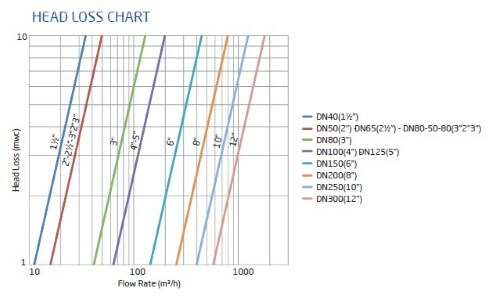 According to flow rate or pressure conditions, it ensures that main valve works in modulated mode by controlling pressure of fluid within main valve actuator (control chamber). inch 1½" 2" 2½" 3" 4" 5" 6" 8" 10" 12"